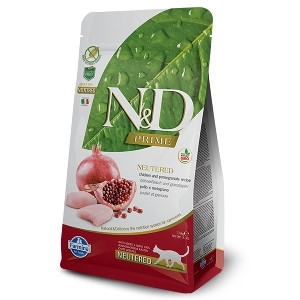 Farmina N&D Chicken & Pomegranate Neutered Cat Food 3.3 lb. Complete food for spayed and neutered adult cats. Farmina N&D Grain-Free Chicken Recipe is formulated to meet the nutritional levels established by the AAFCO Cat Food Nutrient Profiles for maintenance.